Sometimes, most values of a field are the same. For example, if you create a table for employment applications, most employees would be from the same state and only some records would have a different value for the state. If you have such a field in a table, you can provide a common value for the field. During data entry, the user would change the value only if it is different from the usual. Such a common value is referred to as a default value. In both cases, the action would open the Expression Builder where you can create a rule. In the Expression Elements list, make sure RepairOrders is selected. To indicate that a field can be left empty, either don't specify its nullity or set its option as NULL. When data is entered in fields, it is possible to have the same value for a field in different records, such as two people who live in the same state. This is considered as a duplicate value. In some other cases, this may not be acceptable. For example, you may not want two employees to have the same employee number. In this case, you must make sure the records are unique. If a table is displaying in the Datasheet View, to indicate that each record of a field must be unique, click any cell of that column. Then, on the Ribbon, click Fields. 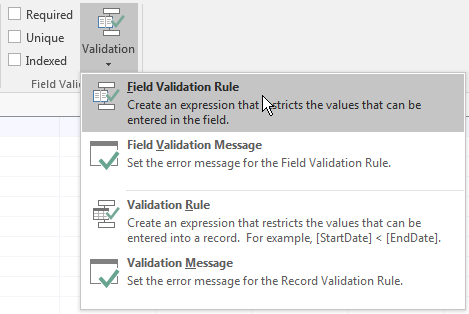 In the Field Validation section, click the check box of the Unique option. Indexation is the ability to keep track of the records of a field such as checking when they are unique or duplicate. 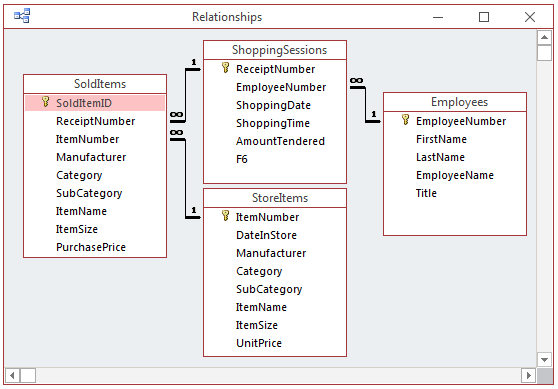 This characteristic can be set when creating or configuring a table in either the Datasheet View or the Design View. In the Datasheet View, to specify the indexation of a field, click any cell of the column. Then, on the Ribbon, click Fields. In the Field Validation section, click the check box of the Unique option. You can select all of the values of one or a group of columns, To select all values of a column, click the column header. 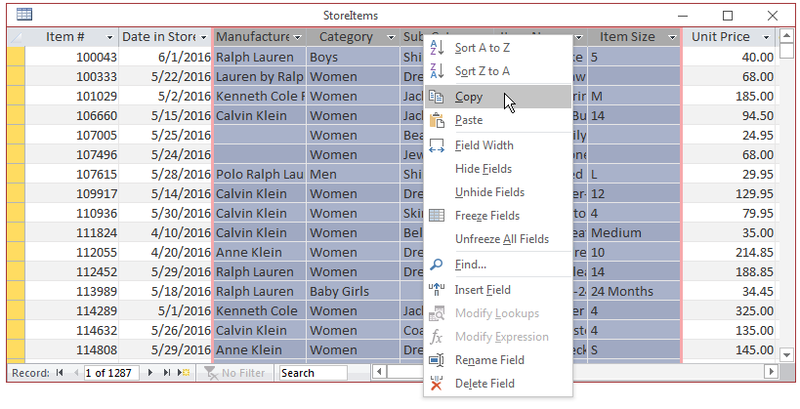 To select columns in a range, use the Shift key while selecting the columns on each range. When all desired rows are highlighted, release the mouse. Another technique used to select more than one row consists of clicking one row that will be at one end, pressing and holding Shift, and then clicking the row that will be at the other end. After selecting (a) records, you can copy it/them and paste them somewhere. For example, you can paste the records in any application that accepts text. Record selection on a form depends on the type of form. 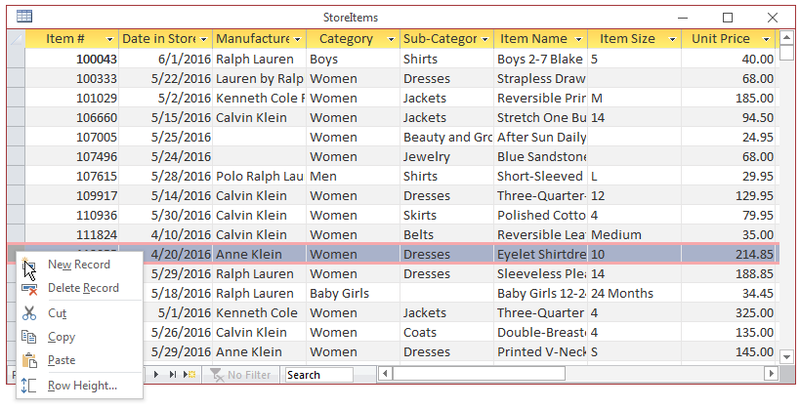 To select a record in a tabular form, click its row header. To edit a record, first locate the intended records, then locate the field that contains the value. Use your knowledge of text processing to edit the value. The Find and Replace dialog box is modeless, meaning you can access the table or form in the background while the dialog box is present. 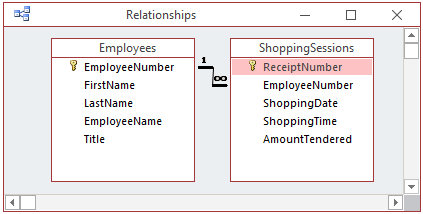 If you had not formally established a relattionship between two tables but had indicated that the records from one table are fed to another table, if you change the value of the (primary or foreign) key in one of the tables, the other table may not receive the update. This is why a formal and well-managed relationship is important. When a record is changed in the primary key of a parent table, it is a good idea for any record of the foreign key, in the child table, to receive the same update. When a record of the primary key is deleted, the child table should be notified. These are referred to as enforcing referential integrity. To enforce integrity when creating a relationship in the Edit Relationship dialog box, click the the Enforce Referential Integrity check box. To make sure that a record in a foreign keyis is updated when the same value in the primary key of a parent table is changed, in the Edit Relationships dialog box, click the Cascade Update Related Fields. When a record is deleted in the parent table, you should make sure the records from the child table are notified. To make this possible, in the Edit Relationships table, click the Cascade Delete Related Records. In the same way, if the table is opened in Datasheet View, click its tab to give it focus, then click File -> Print and select to print or to preview. You can print a form without opening it. 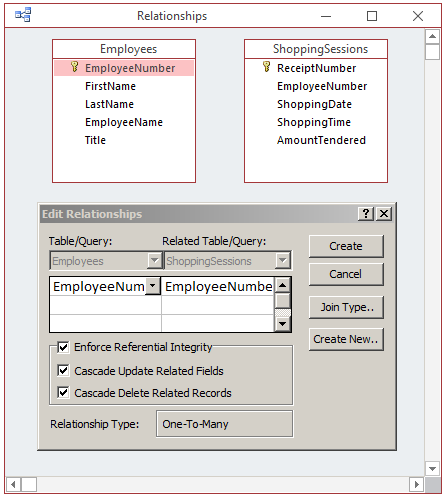 Locate its name in the Navigation Pane and use the same steps reviewed for a table. When a form is opened, you have the option of printing all of its records or the selected one. In the Form View, to print just one record, navigate to the record you would like to print, click the Form Selection bar to select the record and proceed to print. We will print records from 3 to 7. A report provides an object used to print the records of a database. Microsoft Access provides wizards to quickly create reports. 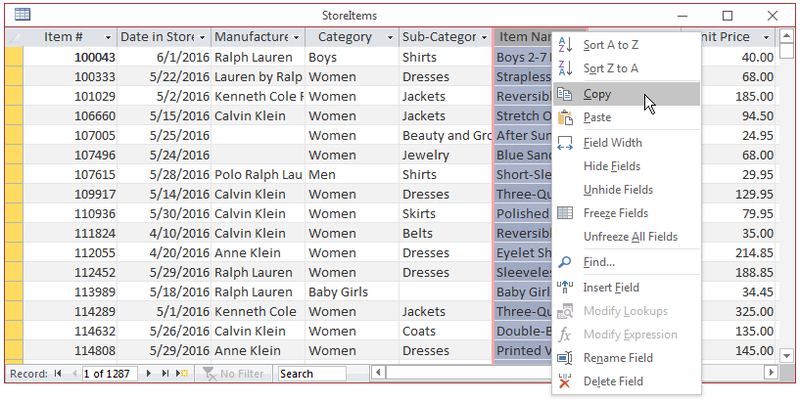 Microsoft Access can help you quickly create a report using one of the pre-designed layouts. This is done using the Report Wizard. The Report Wizard is available from the Reports section of the Create category of the Ribbon. The report is the favorite object used to print data. As done with the other objects, you can print a report whether it is opened or not. If you want to print a report without opening it, in the Navigation Pane, locate the desired report and click it to select it. Then, proceed from the File tab on the Ribbon as we reviewed for the tables and the forms. In the same way, you can first open the report from the Navigation Pane and use the Print menu from the Office Button the same way we described for the other objects. The Cabins report should still be opened. In the table that has a primary key, which is the parent table, when a record is changed, it is a good idea for any record of the foreign key, in the child table, to receive the same update. 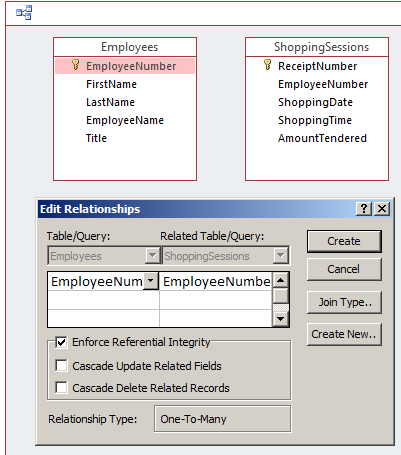 To make this happen, in the Edit Relationships table, click the Cascade Update Related Fields. Right-click the record selector of an empty record and click Paste. To edit a record, first locate the value in the field.